There’s no better time than the holidays to embark on a few household repairs. Just be realistic – don’t tackle a job unless you have the skills, says property expert Laura Henderson. It’s great for the bank-balance and gets the feel-good endorphins flowing, so it’s a sad indictment that so many of our well-intentioned DIY efforts actually end up costing us more in the long run, with more than £150 billion spent on botched home ‘improvements’ in the past decade alone. 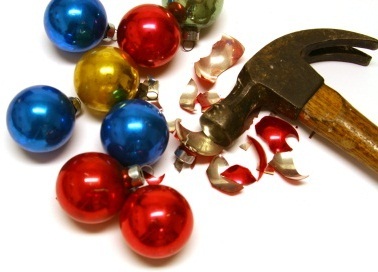 So what precautions can you take to avoid a DIY disaster this Xmas? Check to see if you’re covered for accidental damage including ‘call-out’ cover, particularly if you’re carrying out major work such as relaying the roof or fitting new windows. Make sure also that any structural changes will not void your policy. If you live in a new home, check that any work you carry out will not invalidate the building guarantee the property may have. Check flexes and guards are secure, workbenches are wobble-free and cutting blades are sharp. Any equipment you buy should display approved British or European standard safety marks and come with an operating manual. If hiring equipment, ask for a demo and check the equipment has a tag confirming it has been recently serviced. Always switch off the power and remove the fuse or circuit breaker (MCB) when fixing or checking electrical appliances and take care not to overload plug sockets. A residual current device (RCD) should be used, especially when operating tools outdoors. It will cut off the power supply to the equipment if you accidentally cut through a cable, minimising the risk of electrocution. Always wear with the right protective gear – safety goggles to protect your eyes from debris and fumes, a solvent respirator when working with paint or glue and a dust mask for sanding. Gloves should also be worn when sanding and scraping. It’s illegal for an unqualified person to undertake work on electrical wiring or gas installations. Make sure you get the job tested by a fully qualified electrician and get a Minor Works Certificate of approval. Likewise, a CORGI registered engineer should always carry out any gas installation, servicing and repair work. Ensure your gas appliances are serviced regularly to prevent any build-up of carbon monoxide and get an audible carbon monoxide alarm installed near any gas appliances to detect leaks. Laura Henderson is a property columnist, author and investment expert. Her latest book Tricks and Mortar: The Little Book of Property Wisdom (Book Guild Publishing) is out now on Amazon.